Editor's note: This review originally appeared at Something Else Reviews. When Volbeat’s “Sad Man’s Tongue” comes blaring out of my speakers on a shuffle, I’m always happy, and I always hit repeat — usually a dozen times or so, at least. And I always think about how I nearly missed such a great song. 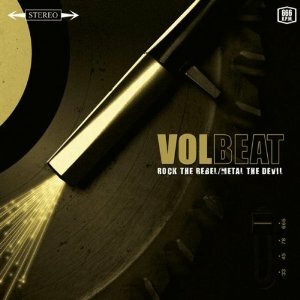 I was plugging along at work one day in 2007 when I got an e-mail from a publicist pushing Rock the Rebel/Metal the Devil, the upcoming record from Danish band Volbeat. In the e-mail was a picture of the band with singer Michael Poulsen boasting a greasy, black pompadour, and the publicist describing the music as “Elvis Metal ‘n’ Roll.” The album title seemed a little awkward (and I often cringe at clichéd connections between metal and the devil), I didn’t quite get the band name, and being the good Southern boy I am, I wondered what in the world a Danish band could know about Elvis. I may have rolled my eyes a little before moving on from the e-mail. The song opens with a dark, Cash-style acoustic guitar, a plucking banjo, a country backbeat and some slide work as Poulsen delivers his best Elvis impression over a first verse that owes more than a little to “Folsom Prison Blues.” It serves to introduce the main character, a young man with “a pocket full of real tales and a broken guitar mode” and dreams of making it big. From there the tune explodes into a slashing Ramones-influenced punk number, then evolves several more times into a Metallica-inspired thrash riff and even a big, beefy breakdown tailor-made for the mosh pit. Through all of that, though, Poulsen and Co. never lose the uber-cool rockabilly vibe from the gritty Cash-tinged opening to Franz Gottschalk’s Kirk Hammett-meets-Chuck Berry guitar solo. Sure, the rockabilly sound is owed largely to Poulsen’s voice and delivery, which has a cool factor all its own (and the pompadour doesn’t hurt), but it’s a total band effort that allows Volbeat to not lose the fun, misadventurous vibe of the song in the intensity of the metallic parts. They’ve tried to repeat the magic of this song a couple of times, with their cover of Hank Williams’ “I’m So Lonesome I Could Cry” and the straight-up rockabilly “16 Dollars” from their more commercially accessible 2010 release Beyond Hell/Above Heaven. But, while they’ve made some good music and all four of their records are well worth checking out for rock fans who haven’t heard them, they’ve never quite captured the magic of “Sad Man’s Tongue” again. It’s a song that has fun, incredible energy and a wide appeal to anyone who just likes a good, old-fashioned rock song.